While we do offer customizable keeper league rankings and occasionally publish some dynasty or keeper focused articles, we realize that some of you in dynasty leagues are hungry for more focused dynasty content. 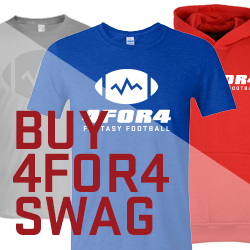 For that, we recommend our friends at DynastyLeagueFootball. Your redraft season is over, and it's nine long months until NFL football kicks off once again next September. Welcome to the off-season! In a dynasty format, there is NO off-season! There's a reason why I've always said: Once you go dynasty, you'll never go back! To be sure, every format has its own set of drawbacks and benefits. There's something to be said about the fun and excitement of a redraft league knowing that there doesn't need to be year-round research and strategy with so much riding on a single draft. Do your research, draft your players, pray to the fantasy gods for a bountiful season and if the stars align, bring home the championship. Win or lose at the end of the season, only the smack talk of the champion carries forward until next year's draft occurs and it all unfolds again. For those that desire the greatest fantasy challenge, the dynasty format is where it's at. There are obvious reasons why so many play both formats. If you are a super-fan of the game, you've undoubtedly dreamed of having your own NFL franchise or, at the very least, being the General Manager (GM) in complete control of your roster and off-season strategy. For most of us, a dynasty league is as close as we're going to get. Many new coaches find their way to dynasty searching for just that sort of challenge, a way to deepen the fun and take their game to the next level. Many more have heard of dynasty but are afraid to take that first step for fear that it's too much of a commitment or takes too much experience to be successful. Nothing could be further from the truth. How much experience will you have next year at this time if you don't start now? The truth of the matter is, if you have passion for the NFL and follow it throughout the off-season, you already have everything you need to be successful in the dynasty format. In dynasty, every new day, off-season or not, presents opportunities for you to better your team or at least read news items that you can use when the time is right. Your initial draft is a fantasy event like no other, where all your passion, research and own strategic insights take form to yield your dynasty roster. Not just a team for the next four months, but players that are yours until such time that you decide otherwise. Play, trade or release them as you see fit! Each month presents continuous opportunities for further immersion. From January when would-be rookies declare for the NFL draft, February and the NFL Combine, April sees further pro days and rookie research and, in May, the much awaited NFL Draft takes place. From that point, fantasy rookie drafts, rookie camps, training camps, preseason and the eventual week one kick off follow. It's a full year of fantasy goodness for the passionate fantasy fan - and there is no better way to test your fantasy chops and extend the experience. The most rewarding aspect of the dynasty format is in the fact that your own strategies, resources and analysis have a direct impact on your long term results. Whether you have a competitive team in the first year or engage in a rebuilding project soon after, there always exists new opportunities and strategies that can improve your team. Gone are the doldrums of the off-season and wishing away time until we get to September. We at DynastyLeagueFootball stand ready to help you claim your first dynasty championship, but you have to make the choice to pick yourself up out of fantasy limbo, cast aside your fear and make 2016 the year that you took your passion to the next level. We're confident that you'll agree with the thousands of other coaches in our community that in dynasty... There is NO off-season!